On January 21, 1743, John Fitch, an inventor and pioneer in steamboat construction, was born in Windsor–a settlement in the British colony of Connecticut. 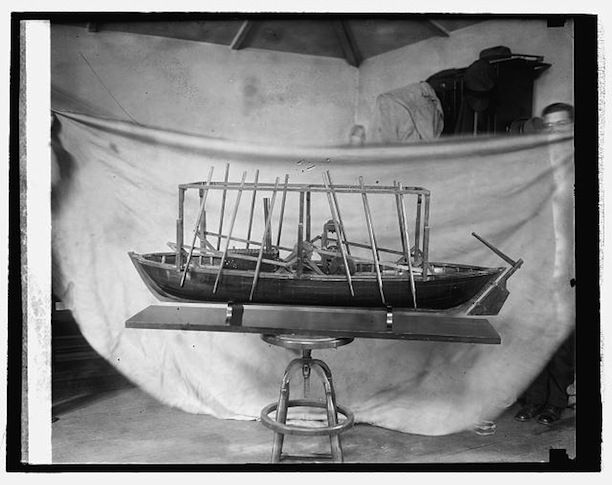 Fitch is credited as the first American to design a practical steamboat. Self-taught in geography, math, and surveying, Fitch first tried his hand at open-water navigation as a young man. Unsatisfied with the work, however, he apprenticed himself to two local clock makers but learned little more than rudimentary metalworking skills and had to be bought out of his indenture by relatives. A few more unsuccessful ventures, including a failed potash manufacturing business, left him heavily in debt. By 1769, Fitch had abandoned his wife and infant child and left Connecticut for greener pastures. He went on to find some success as a silversmith in Trenton, however, and during the Revolutionary War the Committee of Safety of the Province of New Jersey called on him to serve as a gunsmith and armorer. After the Revolution, Fitch saw opportunity in westward expansion. Having lost most of his assets in the war, he moved to Philadelphia and obtained letters of recommendation regarding his skills as a cartographer and engraver. Appointed deputy surveyor, Fitch explored the Ohio River Valley, producing a map of the Northwest Territory (upper Midwest) published in 1785. While surveying the area Fitch pursued his fortune through land speculation but Congress later invalidated his private claims. Frustrated by the inability to make money on the frontier, Fitch took his career in a new direction—claiming to have originated the idea of using steam to propel boats. 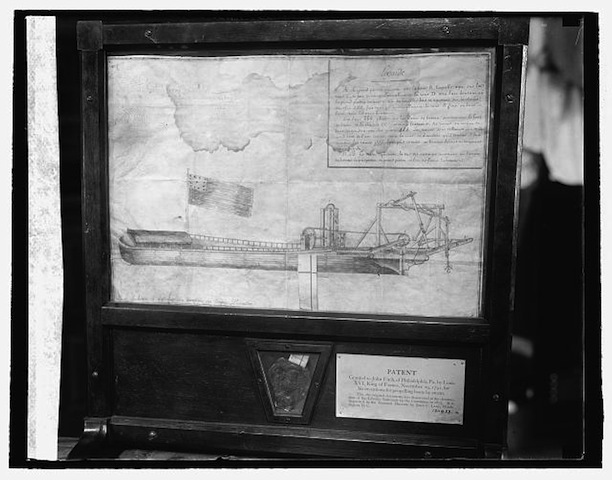 Fitch became obsessed with laying claim to this “original idea.” By the time of the Constitutional Convention he found a partner in Henry Voight, a watchmaker, and they constructed a boat they demonstrated on the Delaware River in August of 1787. The design used 12 side-mounted paddles—six oars to a side—turned by an endless chain. Modifications to this design eventually brought a steamboat into service running the Burlington-Philadelphia-Trenton route in 1790. Court battles between John Fitch and James Rumsey over the origination of the idea led to them both receiving federal patents on August 26, 1791. Their long and highly publicized dispute highlighted the need for a federal patent system to replace the existing state process and eventually contributed to the Patent Act of 1790. Fitch’s steamboat was never a commercial success, however, though he did construct four different boats and demonstrated the feasibility of using steam to propel them; but it is Robert Fulton who most credit with popularizing steam navigation. John Fitch died in obscurity on July 2, 1798, after taking his own life. Fitch, John. “Map - A Map of the Northwest Parts of the United States of America.” Philadelphia, PA: John Fitch, 1785. Brown University, The John Carter Brown Library. Link. Fitch, John. “Print - Plan of Mr. Fitch’s Steam Boat,” 1786. Library of Congress, Prints and Photograph Division. Link. Westcott, Thompson. Life of John Fitch, the Inventor of the Steam-Boat. Philadelphia, PA: J. B. Lippincott & Company, 1857. Link. Fitch, John. The Original Steam-Boat Supported; or, A Reply to Mr. James Rumsey’s Pamphlet. Shewing the True Priority of John Fitch, and the False Datings, &c. of James Rumsey. Philadelphia, PA: Zachariah Poulson, 1788. Link.